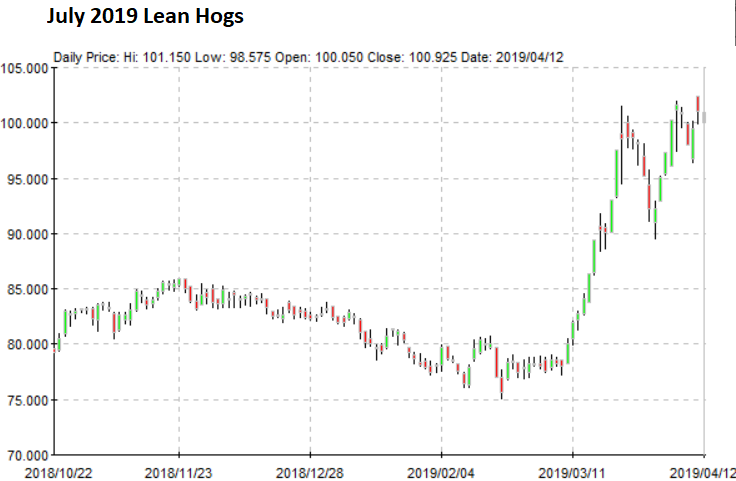 Hog futures are mixed to mostly lower through morning trade with traders slowly but steadily backing away from the market at the end of the week. Additional sales of pork to China were not enough to spark buyer interest. Clearly traders were looking for much more aggressive buying activity from the export sales report in order to maintain previous gains. The fact that current price levels have apparently factored in even larger sales is concerning. Limited movement is seen in all markets ahead of the long weekend. Cash hog trade is expected to be steady to $1 higher; bids are scattered within the range. Prices are lower on the National and on the Iowa Minnesota morning reports. The morning cutout value is also lower. The Canadian Dollar is trading lower against the US dollar at midday. For Thursday, April 18, the Western Hog Exchange Olymel 17 base price is $1.898/kg dressed and the Olymel 19 base price is $1.914/kg dressed. The Olymel 17 weekly price is $1.877/kg dressed and the Olymel 19 weekly price is $1.901/kg dressed. This is Kerrie Simpson reporting from the Western Hog Exchange. 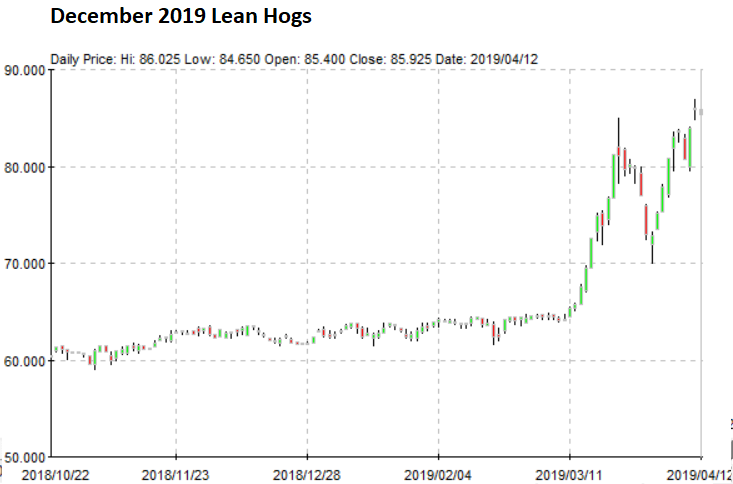 Lean hog futures again reached contract highs over the past week and nearby cash prices also remained strong on continued optimism surrounding potentially improving trade conditions with the US and China. Of course, the spread of ASF also continues to hit headlines and remains a key component to the equation as of late. However as discussed last week and in other recent publications the need for evidence to support the current futures rally is going to have to come in the next few months. So far as shown in the graph here US pork exports have yet to see major change from the year before. US livestock and meat trade data reported January pork exports at 477,765 thousand pounds, a drop of 48.3 million pounds from last reported in a seasonally expected move. This brings total US pork exports 9.2% under the figure last reported in December, and 1.8% under January of last year. 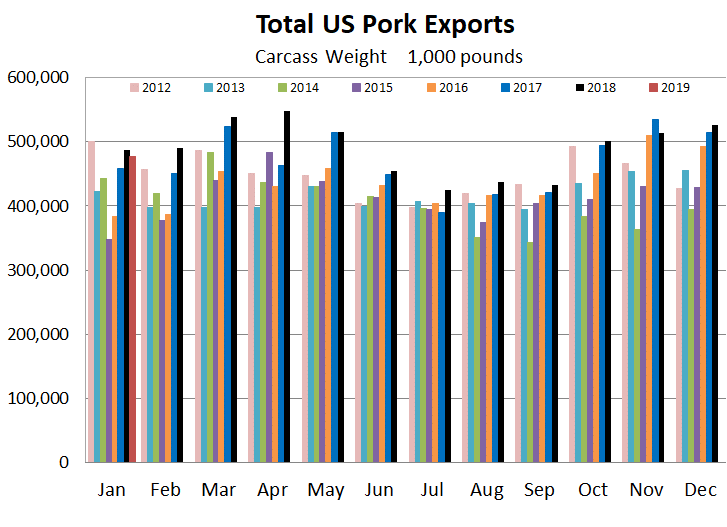 For comparison however, the current seasonal US pork export volume is considered strong and significantly higher than levels reported for January from 2013 to 2017. Exports to South Korea declined the most volume of the monitored destinations for US pork, dropping 22.1 million pounds, followed by volume to Panama which declined 11.3 million pounds. Other major destinations such as China, Canada, Australia and Colombia each declined approximately 6 million pounds from December. Partially offsetting the previous stated declines were reported increases of US pork to Japan, which was up 9.6 million pounds for January, and Mexico which saw volume rise 2.9 million pounds. The five weeks of production in the month of January averaged 522.5 million pounds per week, down 1.7 million pounds per week on average from the weeks of December. Despite the seasonal dip in pork production to start the year, Jan 2019 levels were 4.4% over Jan 2018 and continue at strong rates not previously recorded for the first quarter. Producers are encouraged to continue to monitor the situation and take advantage of current pricing if the opportunity is available. 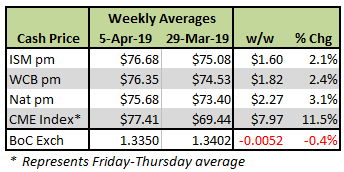 Regional and national cash hog pricing reported another week of strength overall, despite the start and end of the week reporting daily weakness on thin cash bid volume. Cash bid volume was otherwise considered moderate midweek, when cash was reported the strongest. CME cash by comparison reported daily gains each of the last five days, with daily gains losing strength by the week's end. Wholesale pork values were stronger on the week, excluding weakness in hams, bringing pork cutout $0.55/cwt over the previous week's average. Monitored Canadian markets rose another $10-$29/hog higher this week, with those based off slaughter-based data generally rising on the higher end of that range. Lag pricing out of Thunder Creek rose the most, $29/hog higher on the BP2/TCP, while the BP4/TCP rose $21/hog. Values out of Quebec jumped $27/hog, while those out of Ontario, the Sig 4 and the OlyW 19 were up closer to $18/hog. The Sig 5 and OlyW 17 were up more than $11/hog. In the US, values out of Tyson rose $16 and JM climbed $4/hog. Strength in cash hog markets in the last month have supported hog margins to levels not seen since late July of last year. Canadian farrow-to-finish feed costs further helped improve margins with costs down $1/hog, while those in the monitored US region declined $0.60/hog. 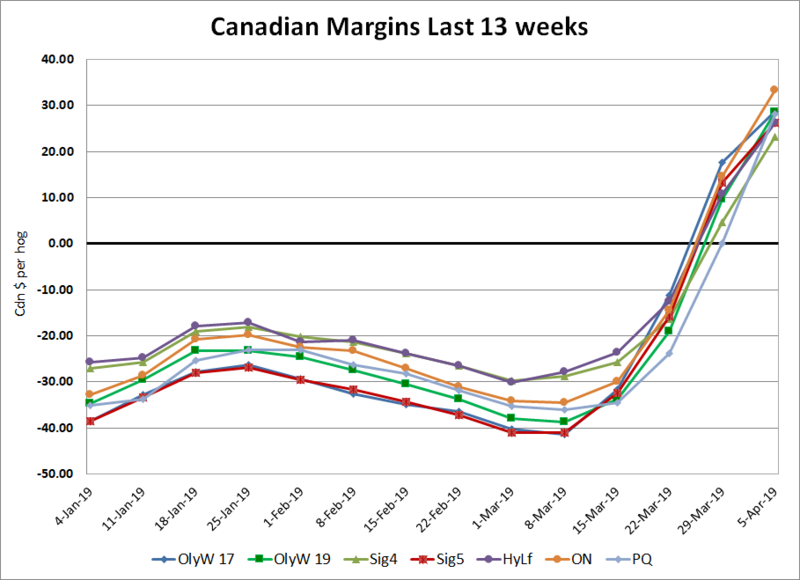 Hog margins were the strongest out of Quebec, strengthening $28/hog, while the OlyW 19, the Sig 4 and margins calculated out of Ontario improved $19/hog. The OlyW 17 strengthened $11/hog from the previous week. In the US, Tyson margins were calculated $17.50/hog stronger and JM margins strengthened short of $5/hog.